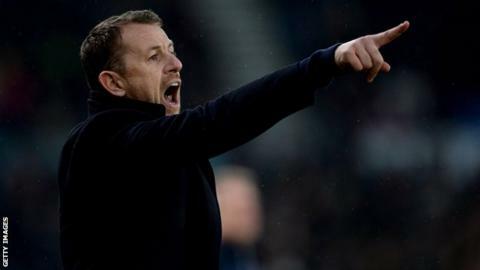 Derby County manager Gary Rowett has called for more support for leading goalscorer Matej Vydra in the battle for promotion from the Championship. Vydra has scored 18 goals, 12 more than the second-highest goalscorers, David Nugent and injured striker Sam Winnall. Derby are fourth in the table, five points adrift of Cardiff in second, and have not won in three games. "If I look at the last seven games, other people have now got to step up," Rowett told BBC Radio Derby. "Vydra at the moment is by far and away our most clinical in front of goal, but to have your second-top scorer on six, that needs to be better, I think some of those players now need to step into gear." Despite being held to home draws by Norwich and Leeds and suffering defeat at Sheffield Wednesday in their last three matches, Rowett said he was satisfied with his side's performances as they prepare for a trip to Reading on Saturday. "Little breaks at the moment don't seem to be going for us and that's been the difference in the last few games," he said. "We haven't been as clinical as at other points in the season. "Someone doesn't want us to win a game at the moment and every game you don't win feels like a defeat, but we've got to embrace the position we're in."